Kenneth Quinn was born in Louisville, KY on December 7th, 1937. He graduated in the top 10 of his class from Central High School, where he was a member of the National Honor Society. He then attended the Speed Scientific School at the University of Louisville. After taking a year off to earn money to continue his education, he attended the University of Kentucky. At UK he participated in a competitive exam offered by Senator Earle C. Clements for an appointment to the U. S. Military Academy at West Point. Through that exam and physical tests at Fort Knox, Ken earned the appointment. While at West Point, Ken won a Regimental championship in boxing, was a member of the Cadet varsity pistol team, and was active in several Cadet clubs. 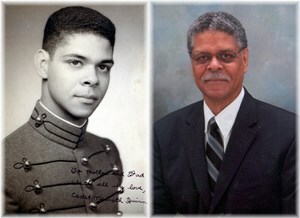 He graduated from West Point with his Bachelor in Science, and following graduation was appointed a Second Lieutenant in the U.S. Army Signal Corps. In 1962 in Augsburg, Germany, he married Barbara Ann Pulliam of Beacon, NY. Ken served a 20-year career in the US Army. During his career, he served as communications advisor to the Vietnamese Signal Corps in 1968 and was awarded a Bronze Star for Meritorious Service by the United States of America and a Staff Service Metal, First Class, by the Republic of Vietnam. He served as a communications advisor to the Guatemalan Armed Forces from 1969 to 1971 and was awarded the Joint Service Commendation Medal for exceptionally meritorious service. He served in Vietnam again in 1972 and was awarded a second Bronze Star for meritorious service by the USA, as well as a Gallantry Cross with Silver Star and an Armed Forces Honor Medal, First Class, by the Republic of Vietnam. From 1973 to 1976, he taught and served in the staff of the Armor School at Fort Knox and was awarded a Commendation Medal for meritorious performance of duty. From 1976-78 he served as a communications-electronics project officer with the Allied Land Forces in Izmir, Turkey, and was awarded a meritorious service medal by the USA. In 1978 he graduated from the US Army Command and General Staff College. From 1979 to 1981, Ken was assigned to the staff of the US Army Signals Warfare Laboratory at Vint Hill Farms, VA. He retired at the rank of Major and was awarded a Meritorious Service Medal, First Oak Leaf Cluster, for dedicated and outstanding service for his career from 1961-1981. Ken earned his MBA with distinction at U of L in 1985, and was elected into the Beta Gamma Sigma honorary society. He then worked as a financial advisor for Merrill Lynch. He also worked with the County government as the Director of the Jefferson County Department of Public Protection, where he supervised Jefferson County EMS and Animal Control and was in charge of much of the County’s licensing and permits. Ken served as the Jefferson County Alcoholic Beverage Control Commissioner and as a Liaison between Jefferson County Government in the County’s 21 Fire Departments. He retired from County government in 1995. Ken was involved in voluntary work with Metro United Way, where he was elected chairman of the Board of Directors. He also served as president of the West Point Society of Kentucky. In 2008, Ken received a Distinguished Alumni Award from Louisville’s Central High School. Ken was a member of the Beta Gamma Sigma honorary society, the West Point Society of Kentucky, and the US Military Academy Association of Graduates. He was preceded in death by his parents, Ramey and LaVerne Quinn, and his brother, Ramey H. Quinn, Jr.
Ken is survived by his loving wife of 57 years, Barbara (Pulliam) Quinn; children, Holly Anne Ruth (Douglas), Susanne Wittmann, and Kenneth L. Quinn, Jr. (Karen); grandchildren Chloe Haffley (Jordan) and Amina Wittmann; brothers, Michael Quinn (Chestealia), Charles Quinn, and Yusuf Bilal; and numerous nieces, nephews, cousins, and friends. He joined the “Long Grey Line” on Sunday, December 2, 2018. Visitation will be held on Wednesday, December 5, 2018 from 11:00 am until the time of his Celebration of Life service at 1:00 pm at Newcomer Cremations, Funerals & Receptions (235 Juneau Drive Louisville, KY 40243). A graveside Military Honors service will be held on Thursday, December 6, 2018 at 11:00 am at Kentucky Veterans Cemetery Central (2501 North Dixie Blvd Radcliff, KY 40160). Memorial expressions in Kenneth’s honor may be made to the Harbor House of Louisville and/or Hosparus of Louisville and/or Norton’s Children’s Hospital. “And when our work is done, our course on life has run, may it be said “Well Done,” be thou at peace”. To leave a special message for the family please use the "Share Memories" portion below. Add your memories to the guest book of Kenneth Quinn. For many months, Ken and I shared an office in the Military Group Guatemala office. We had some great conversations. Ken and Barbara were our dinner guests prior to their departure from Guatemala and were also our guests at several parties we held. Much later, I was on TDY to Fort Knox and was a guest in their home. Later still, the four of us got together for dinner in Louisville. Much later, the Quinns visited us while we attended a military reunion in Louisville. On this occasion, we four also toured a nearby historical site. I have known the two of them since 1971 and Ken was a great soldier and a good friend. Although Ken was the one in uniform, I knew you both as great soldiers. So, Barbara, keep you chin up and continue to soldier as Ken would expect! Please accept condolences from Nevin and Alicia Williams. He was and will always be one of the finest men I have ever known. He led by example and was respected and admired by anyone who had the honor to know him. I was greatly blessed to have he and his family as my next door neighbors for years. I will always love them all. This is indeed a man who deserves to be celebrated. He made this world a better place by being a part of it. Thank you Sir for your service to our country, our community, and for always being a beacon of light in all the lives who loved you so dearly. Until we meet again, may you find peace in heavens hands. To Barbara and the whole family, Bill and I send our sincerest sympathies. We admired Ken for his service to the country and the community. Please accept our condolences for this great loss to you all. Heartfelt Sorrow for the loss of a true American Hero! Thank you for your services. With deepest respect and prayers for his family! Although we cannot be with you in person. We have you and your family in our thoughts and prayers we you love and are here for each one of you at anytime. Jean And Les Streble and Pamela Streble Wright. We always had the Quinn’s across the street from our house, we grew up around them. I would see ken and Barbara out doing there yard work.We all grew up and had kids of our own and they watched our children grow up, my son love going over there and talking with ken . He is in my prayers, prayers for his family. Love you guys ................. Catherine. A salute to you Major Quinn. Be at peace. Grandpa, I remember talking to you on the phone weekly. Those were the few minutes every weekend I looked forward to. I wish we would have spend more time together but the time we had I will remember and cherish forever. You will live on in my heart and memory. Thank you for beeing the best grandpa I could have ever wished for. I love you!